There is a line that runs down through French culinary tradition, starting with Marie-Antoine Carême who popularized grand cuisine in the decades after the French revolution, to Auguste Escoffier who refined Carême’s methods and dishes into French cuisine classique which ruled Europe for the better part of the twentieth century, to Fernand Point who continued to simply the traditions and focused on fresh ingredients, to his protégé Paul Bocuse who championed and popularized nouvelle cuisine, and on to Joël Robuchon in the post-nouvelle era. Joël Robuchon, the post-nouvelle upstart, is now the old man of French cooking. It’s all ancient history now. Except it’s not. Because Paul Bocuse still has his restaurant and he’s still working there (at the age of 87). And it’s pretty much the same thing he was serving 44 years ago when his menu for the maiden Concorde flight caused Henri Gault to coin the phrase nouvelle cuisine. Compared to the cooking of his peers, Paul Bocuse’s methods were revolutionary for their lighter sauces, reliance on fresh ingredients,and reduced cooking times to allow for more natural flavors. 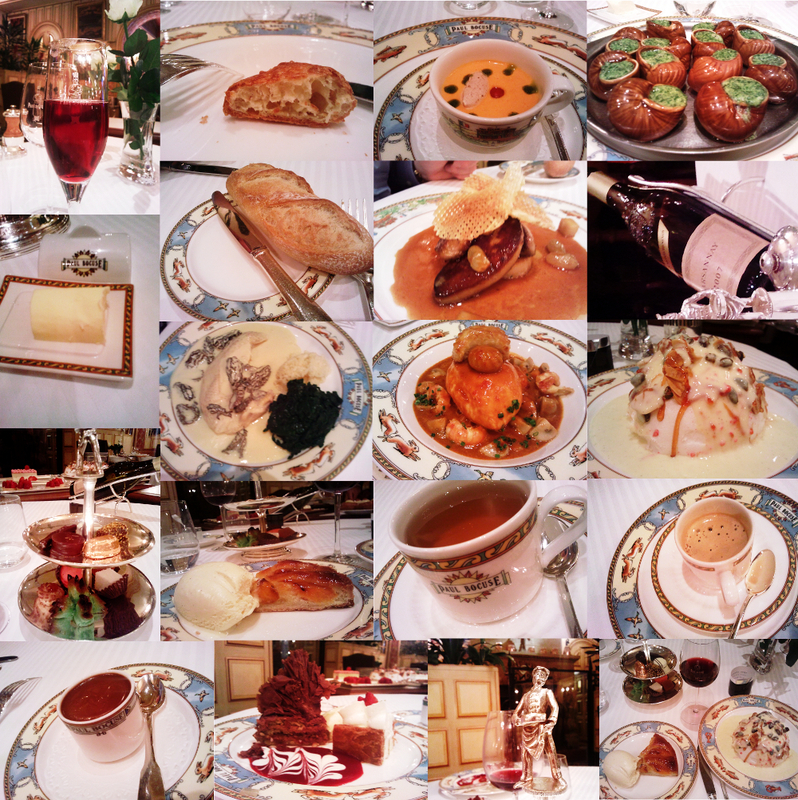 Compared to the most modern of kitchens now though, Bocuse’s menu can seem heavy, rich, and stodgy. To dismiss it as dated or stale would be a mistake however. Eating at L’auberge du Pont de Collonges is like taking a step back in time and having the chance to experience the revolution all over again. Dinner started with a small gougère filled with gruyère , a glass of raspberry champagne, and freshly baked bread and butter. Following that was a light tomato soup with basil oil, a cherry tomato, and crème fraîche. For our starters Leslie chose Burgundy Snails in traditional herb butter, and I had scallop of foie gras with verjus. Leslie loved her snails, although I think she offended the waiter when she poured some of the butter off of them onto her bread. I tried a few and they were perfect. I’m slightly regretting this now because it was only my third time eating escargot and I don’t know if I’ll be able to get my hands on such good snails again. The foie gras was pan fried and served with a tart fruit-based sauce called a verjus (in this case made from pressed apples and grapes). It was a ludicrous serving (at least 6 ounces of foie gras) and I could probably have called it a night at that point. Next up were our mains, though, and we had to keep moving. Leslie went with the quenelles of pike with Nantua (crayfish cream) sauce. Quenelles, a poached fish dumpling, are a specialty of Lyon. The method of preparation is commonly used for pike; the fish forcemeat is sieved to removed the many small bones in the fish. I enjoyed the texture of the quenelle (much like soft tofu) and the dish had a brackish taste which befitted the pike nicely. I had the fricassee of Bresse chicken in a morel cream sauce. This was a quite simple dish, but the richness of the mushroom cream sauce and the excellence of the bird elevated it above any similar dish I’ve had. We are able to get some very good chickens from friends around here, so this is definitely something I’ll be trying to recreate next morel season. Bresse chickens are a special breed that are very hard to find outside of France (I guess because the French eat them all). There is a breed called Blue Foot over here that was derived from the Bresse line. If you know anyone that raises Blue Foot’s (Blue Feet?) please let me know! At this point, we were offered a cheese course. The selection looked superb, but we’d already been eating our way though the Mons Fromagerie at Les Halles de Lyon and at Didier Galland the whole trip and we had to pass it up. That didn’t mean I was going to get out of there with my belt intact though–we still had the dessert course to deal with. Dessert included a tiered tray of various truffles and candied fruits, a cup of chocolate mousse, and 3 trays (!!!) 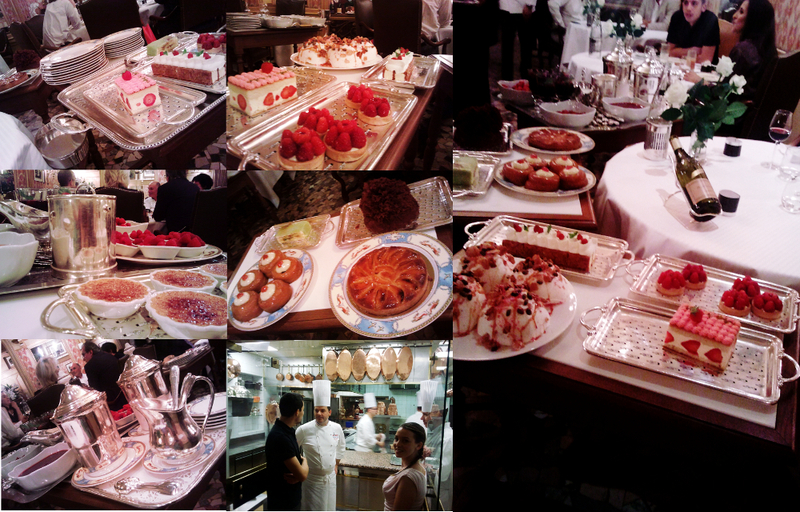 of cakes, tarts, floating islands, ice cream, sorbets, fruits, more cream. And coffee and tea. We tried to sample as much as possible, but there was just no way to get to it all. Most of the desserts were made by a local chocolate-maker called Bernachon whose current head (Philippe Bernachon) just happens to be Paul Bocuse’s grandson. Bernachon needs more than just that passing mention though. The day after our meal at L’auberge du Pont de Collonges, we stopped by the Bernachon shop and Leslie picked up a few different chocolate bars. She had read that David Lebovitz was particularly fond of the chocolate caramel bars they call Kalouga, so she bought two of those. Fast forward a few days an we were home reminiscing about the trip. I got out the Kalouga bar and we gave it a try. It turned out to be the best chocolate either of us have ever had. Well, to be more precise, the chocolate is great, but what makes the bar one of the all time best things I’ve ever eaten is the caramel filling, which is dark, rich, smoky, and even just a little sour. Seriously, this is so good you’ll have to steady yourself on the furniture when you try it. We are kicking ourselves for only buying two bars. Like Paul Bocuse himself, L’auberge du Pont de Collonges has been around pretty much forever. And under (current executive chef) Christophe Muller (and whoever replaces him), I imagine they will serve generations more of customers. But the years of Paul Bocuse still walking through the dinning room, stopping to smile at each table and then walking on are surely few in number. I’m very glad we had the chance to see it.